Live Power raised $2m in a growth series to continue expanding its proprietary sensor network of the power grid. The round was led by LPI Holdings and Yes Energy including both new and existing investors. LPI Holdings represents a group of investors backing the founder, Pal Even Gaarder. Live Power operates a proprietary sensor network monitoring the U.S. power grid to support trading of wholesale electric power. The company will use these funds to complete its sensor network buildout in the MISO (Midcontinent Independent System Operator) power market as well as expand its team of engineers, analysts and field technicians. Until recently market participants had only one choice for real-time grid information. Live Power brings a new generation of technology, delivering data on power plant generation and transmission constraints at 1 minute intervals. ”We are thrilled to continue our rollout beyond PJM and ERCOT with these funds to meet our growing customer expectations,” said Townsend, Live Power's CEO. Live Power headquartered in Boulder, Colorado currently operates a network of 100s of sensors that spans 18 states and 2 regional markets (PJM and ERCOT). The data is sold to utilities, generators and financial institutions that buy and sell electric power in the wholesale market. These customers use the data to manage their positions in this very volatile commodity market. Live Power was founded by Pal Even Gaarder, a Norwegian physicist, who came to the U.S. in 2014 after building a similar grid sensing network in Scandinavia. The current CEO, Bill Townsend, has over 20 years of experience in building commodity trading data and applications. A beautiful day on the job at Live Power. October 9, 2018, Boulder, CO - Last week Genscape filed a second lawsuit against Live Power in an apparent effort to slow Live Power’s success in providing high quality power data to traders in the PJM and ERCOT power markets. Instead of focusing on marketplace competition, Genscape, a Daily Mail owned company, seems to have chosen a strategy of serial litigation. Genscape filed its first lawsuit against Live Power one year ago, alleging patent infringement and tortious interference. After 10 months of litigation, and upon being confronted with Live Power's statements of why there is no patent infringement, Genscape dropped the lawsuit and dismissed its claims instead of actually trying to prove them. Genscape’s second lawsuit, filed in federal court against Live Power and its CEO Bill Townsend, alleges trade secret theft, breach of confidentiality and other similar counts. Live Power and Townsend refute the claims in Genscape’s second lawsuit as baseless and point out that Genscape’s new complaint, like its first complaint, is filled with errors and misrepresentations. The truth is that Live Power’s technology and methods have been evolving since 2008 when its founder Pal Even Gaarder began deploying sensors in Nord Pool based on his research and patented process. The entry of this technology from Europe into the North American power markets is the first real competitive challenge to Genscape’s market dominance in 17 years. Live Power and Townsend intend to defend themselves against Genscape’s second round of allegations and are confident that they will prevail in court. More importantly, however, the lawsuit will not distract Live Power from its primary focus—serving the needs of Live Power’s customers. Live Power will continue to offer great support, to innovate, and to provide a better, faster, and more comprehensive product to the power market. Over the last few months, we have had some breakthroughs on improving the accuracy of our power plant monitoring. This is particularly true for for plants with many transmission lines connected in dense rights of way. In these examples, you can see three market moving plants with a before and after picture of our generation estimates. Until now market participants had struggled with the available information on these plants and often were forced to make assumptions on their output levels or whether they were online at all. Through a combination of our technology, persistence and enough historical observations, we have been able to dramatically improve our generation estimate on these plants. To all of our customers along this journey, we thank you for your constant reminders of how important it is to get this right. The process of where to deploy sensors and how to combine the signals into an estimate of near real-time generation is a patented proprietary process. However, we like to share some basic steps and principles used to help our customers understand the basis of the data. Deploying sensors along as many high voltage lines connected to the plant for which we can find a landowner. Screening of initial sensor data. Do we have noisy data? Are there too many lines interfering with each other? Examining data for historical operating patterns based on historical data from CEMS, NRC, ERCOT, EIA, EQR, and wind speed. Do we clearly see startups/shutdowns and capacity blocks. Choose training and validation periods and create calibration models for each facility. Peer review process - every released or re-calibrated plant goes through a peer review that often results in reworking the analysis or additional field work. We may want to add more sensors or move one to a different location. If the generation estimate looks good we will release a new plant as REVIEW status. Wait and observe how the values change over time and during line outage events. We assess if the calibration is stable or unstable during line outages and adjust to these different grid states. Review generation estimate against new reference data and recalibrate if necessary. Again we choose multiple training and validation periods and test the model again. Revise monitoring plan. What can we still work on to make this better? Conduct a field survey and begin to dis-aggregate multiple circuits? We are always willing to share our strengths and weaknesses with our customers. In some cases, we may have a lot of noise at zero output. Or in other cases we may be very confident of the capacity blocks or individual generating unit output. Customer Notes are provided in our interface to communicate all the relevant caveats around the data. Additionally, we post if something is going on like a line outage or even if our sensor is not working properly. You can choose how to use our data with as complete an understanding as you need to assess the benefits or risks. As our final step we will restate history and publish that revised history to our customers. This is to provide the best and most accurate data series for analytical uses. In most cases, this is just the past few months of recent history. In the event it is needed, we keep all the historical versions of each data record and can produce them upon request. So, check it out and tell us if we are setting the bar higher for quality and accuracy. In the course of deploying our magnetic field sensors to monitor two power plants in South Texas, we figured out that we were also monitoring local loads. This opens the door to a greater level of resolution on real-time load data than currently available. 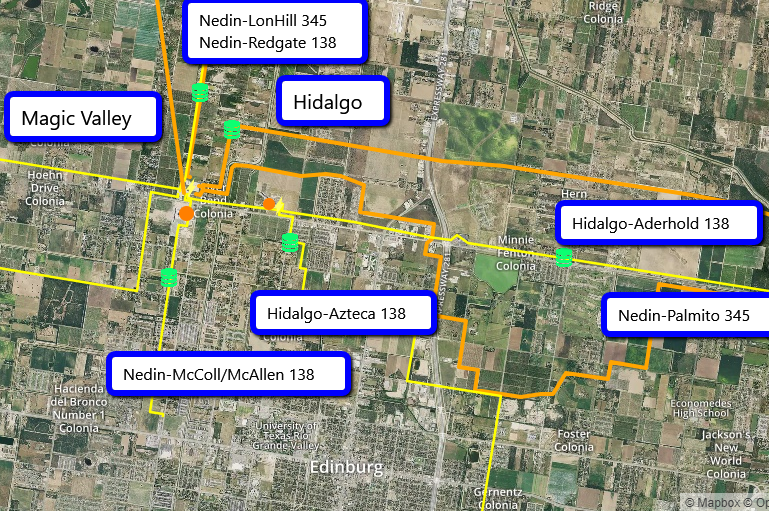 We deployed sensors on many of the 138 kV lines connected to the Hidalgo substation and compared them with 60 day delayed ERCOT state estimator data. We discovered two things. First our measurement was highly accurate prior to even using any of the state estimator data to improve it. Second, all of the 138 kV lines had identical load shapes. We concluded that they are all serving the same local loads in the area. Our next question was how different is this load shape from the zonal load data already provided from ERCOT. Because the zones are so large we hoped that a more local breakdown of load would be meaningful and provide some insight into LMP spreads. The load shape shows that this area has a diurnal load shape that is offsetting the zonal load during some peak hours. We are now discussing how we use this load monitoring capability to improve your virtual, bal-day or FTR trading. If you have ideas then get in touch us at info@lpi.energy. 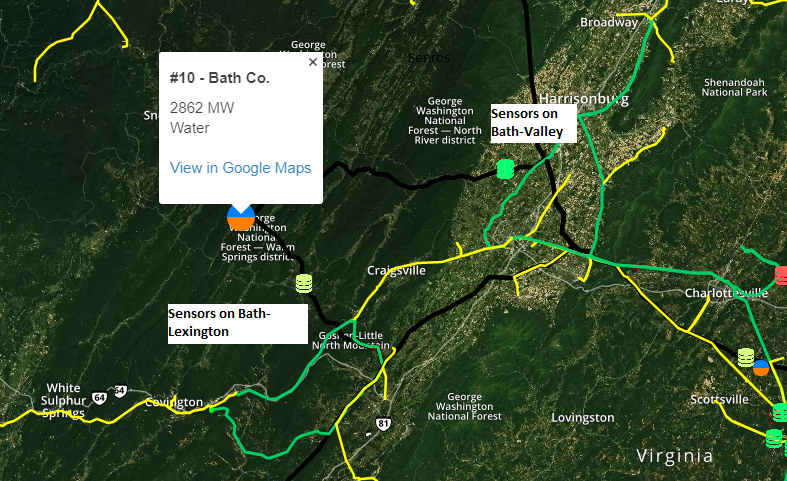 Bath County is the largest pumped storage hydro plant in North America with nearly 3 GW of generating capacity. As a giant battery in the PJM market, its sudden generation can act as dampener on real-time prices. This makes it a closely watched fundamental for all PJM cash traders. At LIVE POWER, it is the most watched piece of data that we produce every 60 seconds. Recently, we had a sensor failure due to a problem with our cellular reception. We learned very quickly how important this data set was too our customers. So, we doubled our coverage of this facility. To address reliability, we placed double the amount of sensors to have 100% redundancy at each site. Then we also added a second cellular carrier at each site to have 100% redundancy on data communications. To address accuracy, we conducted site surveys at each sensor location and created a 3D model of the geometry between the conductors and our sensors. This allows us to create a very accurate model of the magnetic field and our sensor. We can now calibrate each line to this model as well. This provides a 3 method of validation of our estimates. It also makes our estimates more stable in the event that one line goes on outage.